How to Get Rid of Foxes in the House and Yard - Many people don’t know that they have a fox problem until they spot the animal sneaking through the yard in the middle of the night. Foxes are very timid and reclusive, taking their food back to their dens to be consumed, leaving very little evidence that they were around at all. Sometimes foxes will choose to live in your yard. This can be because of over-predation in the wild or because of an abundance of food near your home. If you have a fox living and in your yard and you want it to go away, the best method is to have the animal trapped and removed. Foxes are effectively trapped in cage traps and relocated to an area where they can find adequate food and shelter. Trapping foxes can be difficult because of how intelligent and cautious these animals are. Place the trap near the fox den but do not set it. Leave bait in the trap for a few days and allow the fox to take it without capture. Once the animal has established some trust of the device, set it and place fresh bait. If all goes well, the fox will soon be caught. Foxes are omnivorous, usually preferring to eat meat and carrion. They will enter a garden and eat the insects and other small creatures that live there. This search for smaller prey may cause them to dig up vegetables or flowers. To get rid of a fox in the garden, a live, cage trap is an effective way to go about it. You need to be very careful with your cages traps. Pre-baiting is advised for a few days prior to setting the device. 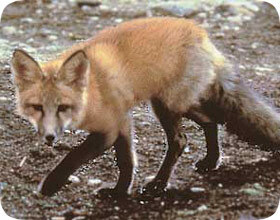 A fox will avoid a trap forever if it is set improperly or on unstable ground. These animals are too cautious and smart to be trapped by luck. Place the trap near the garden or near the den if one has been located. If you catch the fox, cover the trap with a blanket or tarp to calm the animal while you transport it to a new area for relocation. Be sure to select a place with adequate cover and the opportunity for wild food. Foxes under the shed may seem difficult to catch, but the reality can be the exact opposite. When a fox den has been discovered, the live traps are easier to set because you can be certain the foxes will encounter them. Trapping a fox is not as easy as it may seem. It is a more involved process than just purchasing and baiting a live, cage trap. Cage traps are very effective if set properly. Setting a trap properly means selecting the right target area and using the correct bait. The trap must be on level ground to prevent any wobbling. Foxes are very leery of new items in their territory. If the trap is deemed dangerous, you will never catch the fox in that trap. When a den is confined beneath a shed, the use of temporary fencing can help channel the fox toward the baited trap. It is recommended that the trap be left unset for a few days to allow the small canine to take the bait without fear of capture. Once you are certain the fox has entered and exited the trap without issue, set the pressure plate. Relocate any foxes at least one mile away from your home. Chicken coops and rabbit hutches can be prime targets for foxes. These enclosures are unguarded and often open, allowing any animal to wander in. Foxes will find a way to enter even a fenced in coop, leaving no indication of their transgression except for the hole under the fence or some chewed chicken wire. The best way to get rid of foxes in chicken coops is to find a way to keep them out in the first place. A perimeter fence is a good idea but the fence must extend into the ground to discourage digging beneath it. You can electrify the fence, too, but if it extends underground this step isn’t necessary. Fences should be of heavier gauge wire than regular chicken fencing. You can do a similar thing for other animals - read about Are Foxes Dangerous to Pets? If you do have a fox getting in, repair any damage the animal has caused and set up some cage traps. You can be fairly certain that the fox will return to the area where it broke through to the coop, so place the trap in that location. Bait the trap for a few days with enough food to discourage the fox from trying to re-enter the coop. Once the animal starts to rely on the trap for food you can set it and hope for a catch. Any trapped foxes should be removed from the property and relocated to a safe area where they will have the best chance of survival without an established burrow. Go back to the main Fox Removal page for more information about fox prevention, and more information about how to keep foxs away.